Ryan Baker slots home Belper United's second goal against Teversal (PHOTO BY: Mike Smith). Second-half dominance was not enough to cancel out two early goals as Teversal fought back bravely away to mid-table rivals, Belper United. 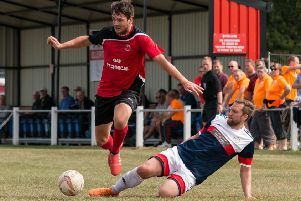 Instead they fell 2-1, their fifth defeat from eight games in the Premier Division of the East Midlands Counties League as their period of transition continues after the change of management in the summer. Belper bossed the early exchanges and took a well-deserved lead in the ninth minute. But the goal was shrouded in controversy because striker Ben Gowing appeared to control Ben Rushby’s over-hit cross with his outstretched arm before putting the ball back into the area, where James Rushton touched it home. It was 2-0 ten minutes later when James Rushby threaded a perfectly-weighted pass and Ryan Baker timed his run to perfection to take the ball in his stride and knock it past advancing goalkeeper Rio Alberry. Teversal’s comeback started in the 50th minute when Danny O’Donnell finished off an impressive move at the second attempt from 18 yards, leaving ‘keeper Mark Rathbone with no chance. They continued to call the tune, but didn’t enjoy the rub of the green, particularly when a powerful, goalbound free-kick from O’Donnell came off the shoulder of a Belper defender. This Saturday (3 pm), Teversal entertain Heanor Town. TEVERSAL LINE-UP -- Alberry/ Griffiths (Bartle 51), Allen, Cartwright, Travis, Pride, Jenkins (Lavelle 23), Smith, Vernon, O’Donnell (Agbakosi 79), Wilkinson. Sub not used: Laister.